Fool’s Cap is the highest level regular herb, making it the most valuable herb aside from Golden Lotus. It can only be found in a few select places in Dread Wastes and in Townlong Steppes. It’s used to make a few potions, elixirs and Flask of Winter’s Bite (+1 strength). It’s best to sell these in full stacks of 20 on the auction house. Most players will be struggling to get enough Golden Lotus and be willing to pay whatever for Fool’s Cap when it comes time to craft flasks. You’ll want to be level 90 with a flying mount and with herbalism level 600 or higher. Update: You can make a lot of gold with Fool's Cap, but if you want to step it up and make thousands of gold you should read my personal favorite guide. Fool’s Cap can be found around swampy areas and inland water sources within Dread Wastes and Townlong Steppes. The best place is in the south west of Dread Wastes where there are a bunch of islands sticking up in the water (The Briny Muck), but since there is only so much there you’ll probably find yourself flying all over looking for more. 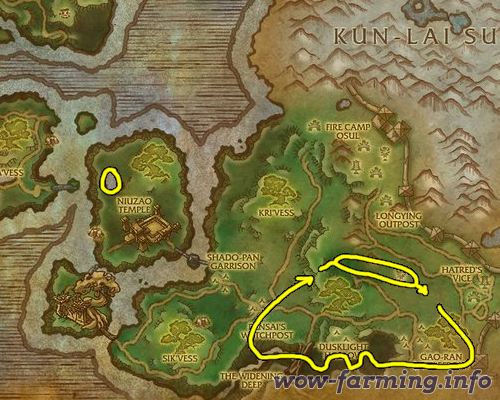 The best place to farm Fool’s Cap is in Dread Wastes, mostly in the south west where you see the zig zags in the map below. The dotted line represents a path where you won’t find any Fool’s Cap, but you might find other valuable herbs, so it’s worth circling Dread Wastes. Consider entering Townlong Steppes before coming back down along the wall to the east. 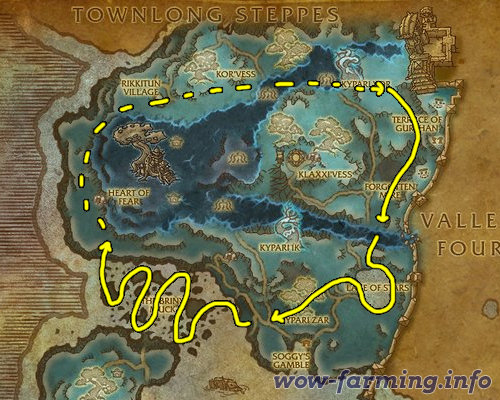 The next best place to farm Fool’s Cap is in Townlong Steppes. There are only a few choice places where you’ll find it though, as you can see in the map there is some in the southern low lands area as well as an area south of Longying Outpost. Take a quick trip through Townlong and then head south back into Dread Wastes.